Another exceptional piece to our Art Deco collection. 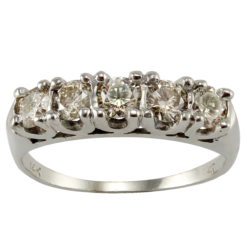 Made from 14kt White gold, this Ring features a 0.25ct total weight, European cut Diamond that is bezel set in a highly stylized mounting. The Diamond is “H” in color and “SI” in clarity.